A 911 call was made at 11:09 p.m. on October 15, 2015, to report a battery incident involving a relatively minor use of force. Police arrived nearly a half-hour later, found no evidence of a crime having occurred, and went on their way. The reality of the situation, however, was quite different, according to a report on the incident later published by The New Orleans Advocate. In actuality, a car had blown through a stop sign just after 11 p.m. in the popular Marigny neighborhood of New Orleans. A 64-year-old man visiting from San Diego was nearly hit by the car and exchanged angry words with the driver, who a witness says subsequently assaulted the tourist. The victim was ultimately paralyzed. This incident is a particularly egregious example of the effect that lengthy police response times2 can have on a city’s crime totals. Over the course of the hundreds of thousands of incidents that take place each year, long response times can lead to officers recording fewer incidents as crimes, which in turn can hurt the reliability of crime totals tallied by the FBI when the agency compiles national statistics. And ultimately, these delays can erode public confidence in the police. 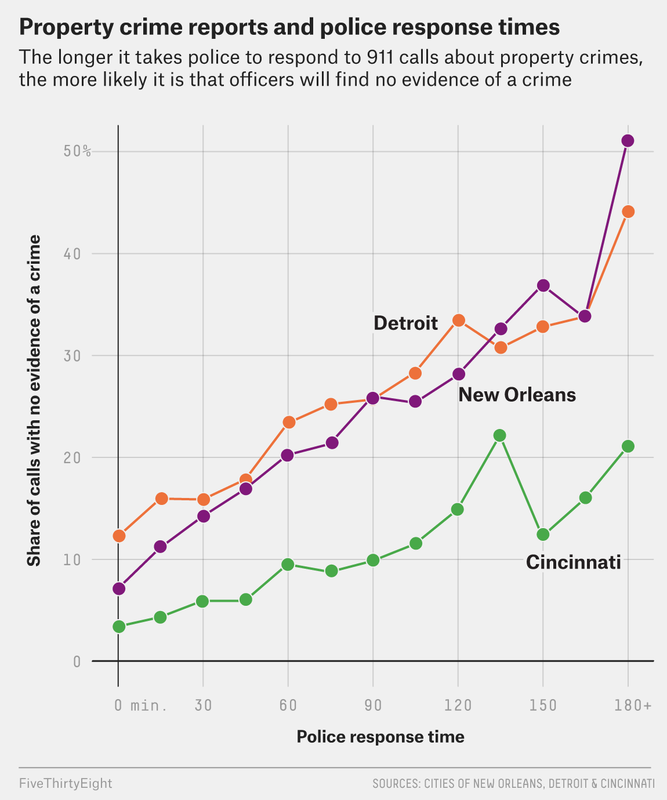 For this piece, I analyzed 2016 data from three cities, New Orleans, Detroit and Cincinnati,3 and found that as response times go up, the likelihood that a crime will be found goes down. Indeed, in all three cities, when police took more than two hours to respond, they were over 2.5 times more likely to report they’d found no evidence that a crime had occurred. Nationwide, about 86 percent of all major crimes reported by the FBI in 2016 were property crimes (theft, auto theft and burglary). Violent crimes (such as murder and armed robbery) were much less common across the country and often received faster police responses in the cities analyzed here. Looking more closely at 911 calls reporting property crime, therefore, can show how longer response times may deflate the number of crimes that get investigated and ultimately reported. Lots of cities provide open access to Calls for Service data,4 but research into this subject is difficult because the data is not standardized and only a handful of cities provide information on the time of the initial call, the time of arrival, and the final status of the call. That determination of the incident’s status, referred to by police as its disposition, is made by the police and dispatcher. For instance, the disposition could be a finding that a burglary occurred and a report is needed, or that an alarm just went off because the wind blew a door open. Furthermore, the disposition can reflect an officer’s inability to locate evidence that a crime occurred either because no crime did occur or because no victim or witness was present when the officer arrived. The chart below shows how longer response times may deflate the number of crimes reported in these cities — the chart measures the percentage of property-crime-related Calls for Service that were ultimately marked as unfounded compared to police response time in minutes.6 As response times got longer, the percentage of incidents deemed unfounded also increased. In Detroit, only 16 percent of property crime incidents in which an officer arrived in under two hours received a disposition of unfounded, compared to 40 percent of dispositions following police response times of two hours or longer. Similarly, in New Orleans, 13 percent of incidents with a response time of under two hours received an unfounded disposition, compared to 46 percent of incidents with response times longer than two hours. The problem was less acute but still apparent in Cincinnati’s data, which showed that 4 percent of 2016 property crime reports that were responded to in under two hours received an unfounded disposition, but 18 percent of such crimes where the response time was over two hours got the same designation. These three cities point to long response times as a contributing factor in the rate of recording of property crimes, though it’s hard to draw firm conclusions about the impact long response times have on national crime figures from such a limited sample. Why might these cities be experiencing such lags? Most big police departments shrank during the last recession, and there is evidence that lower staffing levels mean dispatchers have fewer officers available to respond to incidents when they occur, which results in longer response times. Denver police, for example, noted in 2013 that there was a strong correlation between a drop in staffing in the years following the recession and rising response times. It’s also worth remembering that there may be good reasons for longer response times on some calls. For example, several cities, including Cincinnati, allow certain non-emergency reports to be filed online with the understanding that contact with police will occur hours or even days later.8 Alternatively, the dispatcher may be aware that a caller is unlikely to remain on the scene and prioritize accordingly, though this information would not appear in the publicly available data set. 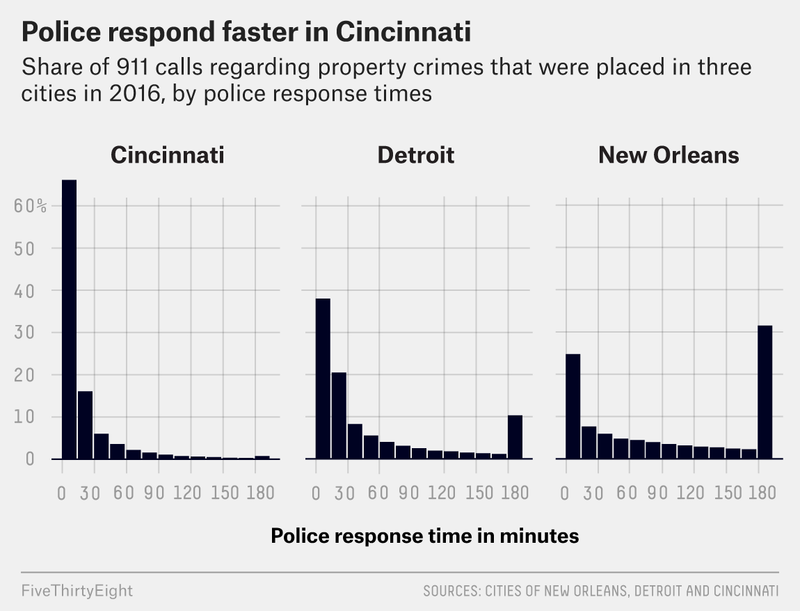 That said, longer response times were associated with higher percentages of unfounded incidents in all three cities even after accounting for different call priorities or when looking only at more serious crimes, such as robbery. Ultimately, crime statistics can be confusing and misleading. A major challenge to better understanding how delayed police responses may affect reported crime figures is that national police response times are not formally collected and disseminated. Less than half of crimes that occur are reported to police, and long response times are a likely contributing factor to this trend of underreporting. The Calls for Service database includes nearly all actions formally taken by police officers. This includes responding to 911 calls but also actions initiated by the officers themselves, such as traffic stops or observing a suspicious person’s behavior. Calls for Service are not the same as formal crime counts, but the number of these calls for certain types of crimes is strongly correlated with the number of those crimes that ultimately show up in the crime statistics. For this article, “response times” are defined as the amount of time that elapses between when the 911 dispatcher is notified of an incident and when an officer arrives at the scene. In instances where an officer’s arrival time was not available (10 to 20 percent of calls), time of dispatch was used instead. The dispatch time is the moment that an officer is assigned to respond to an incident but does not include the amount of time it takes the officer to travel to the scene. Since using the dispatch time rather than the arrival time necessarily results in a shorter total response time, this method slightly underestimates total response times. For New Orleans and Cincinnati, I used Calls for Service data for all of 2016, and for Detroit, I used data for Jan. 1, 2016, through Sept. 20, 2016. Detroit’s publicly available Calls for Service database does not contain disposition data for calls placed after Sept. 20, so it is not usable for this purpose. Full disclosure: I do some consulting work on behalf of the Police Foundation promoting the Police Data Initiative, where these data sets are catalogued. Some cities use different names for the same dispositions, but this analysis relies on comparing incidents where no evidence of a crime was found against all other incidents, regardless of disposition. “Unfounded” in this article therefore also includes the determinations “gone on arrival” in New Orleans; “NCF” (no complainant found) or “no problem found” in Detroit; and “gone on arrival,” “nothing to report,” “unable to locate” or “no violation” in Cincinnati. For this analysis, I removed any incident that lacked either a disposition or a measurable response time. Often calls that don’t include a measurable response time are a result of a 911 call being canceled or the call being revealed to be duplicate report of an incident that’s already in the system. Cincinnati’s manpower was down only 3 percent from 2008 to 2016. Cincinnati allowed online reporting throughout 2016. New Orleans recently launched a similar program, although it is too new for reports filed that way to appear in the 2016 data used here. Detroit does not appear to use any such system.